Free Divs started on myspace on the 3rd of November 2005 by Nick. With help from some of his friends and dedication to making layouts the group soon became big, attracting more than 100 people each day to join. After about a year it became too big for Nick to moderate on his own, so he asked for help from the members, only a few said they would help with making layouts, but a lot of people helped out by answering questions in the fourms. After a while he appointed two of the designers as co-moderators due to spam in the fourms getting too much for him to handle on his own (which has stopped now, thankfully). 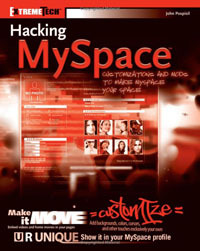 After a year of the group starting John Pospisil contacted Nick and asked to use one of the div layouts codes in his new book Hacking Myspace: Mods and Customizations to make MySpace Your Space. Nick said yes and so now one of his divs is published in this wonderful book. After 2 years of the group starting we had around 225 divs and over 10,000 members. The groups mod account was sadly broken into by someone and the group deleted. So we have now started again, and with this website and our blog we hope to remain one of so many great customising groups on myspace.